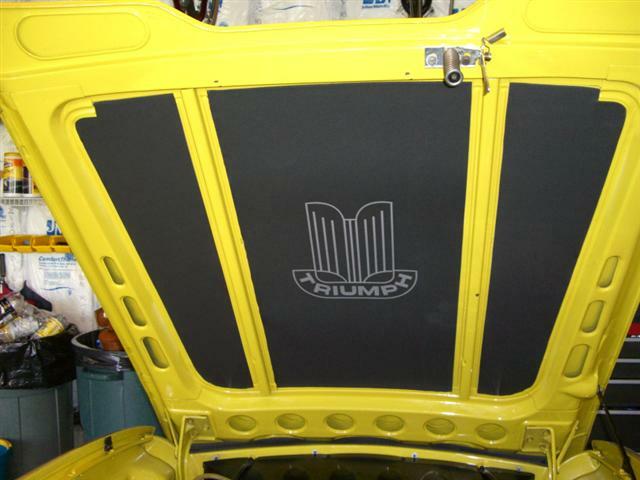 Sometime over the winter I stumbled on this company on eBay selling really cool hood liners for the TR6. The outfit is called The 928 Leather Shop and they obviously specialize in doing leather work for the Porsche 928. Poke around their web site and you'll get to see one of Jay Leno's cars that they worked on. I don't know that you really need a Hood Liner on a TR6, but I liked the look of it so I ordered one a month or so ago. The installation was quite easy but it does take two people to get the large center piece in place. It would be much easier to install on a hood that was off the car but I wasn't about to take my hood off so......"Honey, I need you for a few minutes". POST NOTE: Read the directions and use the correct adhesive to avoid what happened to me!. After an hour of driving, I got home and popped the hood to find the liner lying on the engine. I emailed Bob Budd and he immediately responded with the possible causes and the offer of a replacement liner. 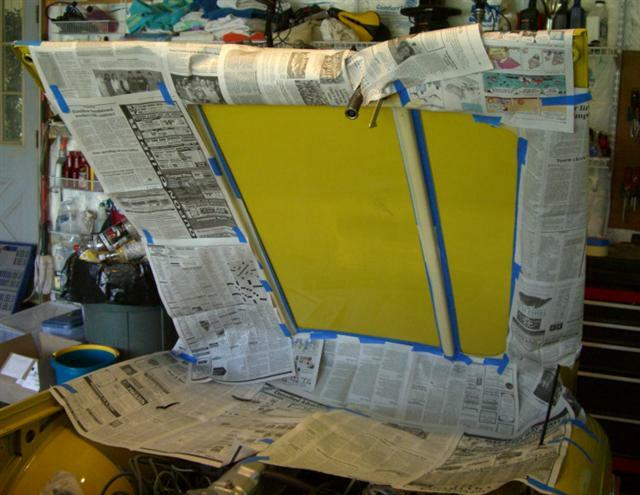 The problem was my use of an adhesive that's not recommended in a high heat situation. 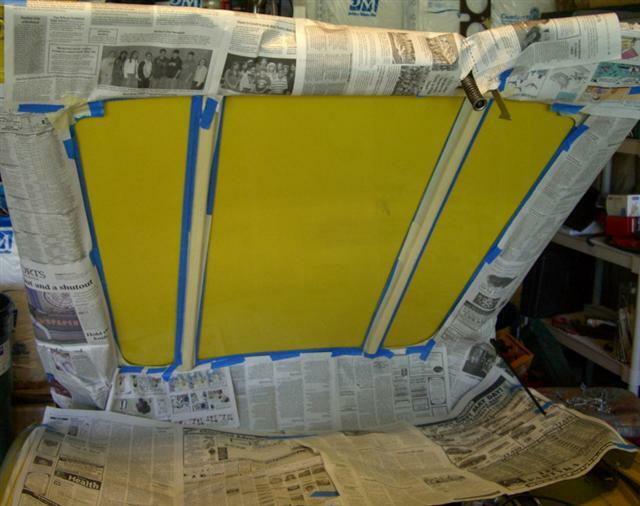 I used 3M Super 77 Spray Adhesive while Bob only recommends 3M #80 (200o) or #90 (160o) Spray Adhesive. The up side of this mishap is that the liner sat directly on a very hot engine and suffered no heat damage at all. This stuff is tough! Time to go buy the recommended adhesive. BTW...Bob Budd insists on replacing the hood liner with a new one at no charge. I told him that the only "damage" to the existing one was 2 small dents where it rested on the thermostat and the valve cover nut but he doesn't want any dented liner on my car! Now that's great customer service. POST POST NOTE: So last week (7/21/07) before leaving the VTR National Convention for the drive home I check the oil, it's down a smidge and I've got a smidge in one bottle. Top it off, check the level, toss the bottle out and close the hood. Drive for 2 hours up the Jersey Turnpike and the Garden State Pkwy and stop for a break at a rest area. Pop the hood to check on a small coolant leak I developed and...........What the @$%#....there's oil everywhere.....the hood liner is covered, as is the engine bay.........and there sitting on the battery is the oil filler cap smiling at me. What a mess. What a dummy. Luckily it was all splatter and no quantity lost as I didn't even have to add any oil. Anyhow, yesterday I cleaned the engine bay and took the old hood liner that fell off and covered a 10" circle with oil and let it sit overnight. Today I hit the spot with "Greased Lighting", wiped it up, rinsed with water and there's absolutely no evidence of oil. So I did the same with the liner on the car and it came out looking like new. I couldn't believe it. Bob states on his site that they WILL NOT absorb oil and they won't. Even the logo looks great. My wife's only comment was...."at least it didn't happen on the way TO the VTR Convention" :-) Got to love her. Here are the three pieces and the logo. I didn't realize that the logo had to be installed by me! The first thing you have to do is trim the logo and peel off the backing. The next step is to get both the liner and the logo really wet with a spray bottle. squeegee out all the bubbles and water. peel the paper away from the logo. This is the end result! install them but they're easily trimmed with a razor.